Whether a in the form of a horse or a more unique animal, a rocking toy is one of those classic playroom staples every child needs. 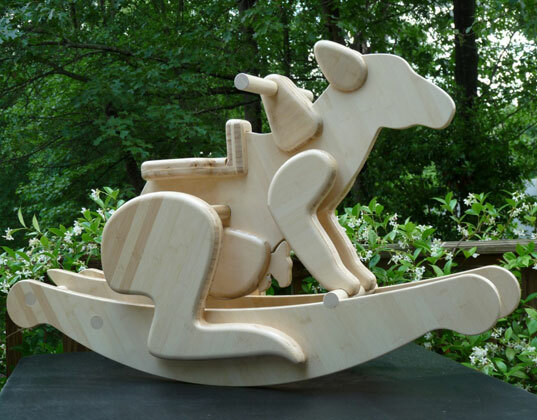 Rocking Frog’s bamboo Kangaroo with Joey rocker offers kids a ride through the Outback and a fun surprise, too — the mama roo’s joey is sweetly tucked in her “pocket” and can be taken out to play. Inspired by a rocking frog the designer built his daughter when she was 3, the rockers are handcrafted from sustainable materials including bamboo and non-toxic and plant based natural finishes. If a trip Down Under isn’t her thing, you can choose a dog or frog instead. Whether a in the form of a horse or a more unique animal, a rocking toy is one of those classic playroom staples every child needs. Rocking Frog's bamboo Kangaroo with Joey rocker offers kids a ride through the Outback and a fun surprise, too -- the mama roo's joey is sweetly tucked in her "pocket" and can be taken out to play. Inspired by a rocking frog the designer built his daughter when she was 3, the rockers are handcrafted from sustainable materials including bamboo and non-toxic and plant based natural finishes. If a trip Down Under isn't her thing, you can choose a dog or frog instead.